Sydney is Australia’s largest urban area, having passed Melbourne in the last half of the 19th century. With an urban area population of approximately 3.6 million, Sydney leads Melbourne by nearly 300,000. The “Great Australian Dream” in Sydney: Sydney incubated and perfected the Great Australian Dream. New housing was built in all directions from the central business district. The most expensive was built to the east and north, while the least expensive – the bungalows and other modest detached houses – rose principally to the west and the south. Western Sydney is the culmination of the Great Australian Dream for perhaps more middle and lower middle income households than any other place in the nation. Of course, Western Sydney was not planned in the radical sense of the word currently used by contemporary urbanists. In fact, most have little more regard for Western Sydney than for the shantytowns of Jakarta or Manila. Yet, the people of Western Sydney, like the people of countless modest suburban areas around the world, are proud of their communities and of their homes. Rationing Land, Blowing Out Land Prices: About three decades ago, Sydney embarked upon what was to become one of the world’s strongest “smart growth” programs (called “urban consolidation” in Australia). Aimed at concentrating population closer to the core, urban consolidation sought to restrict and even prohibit new housing on the urban fringe. Sydney developed its own equivalent of the famous Portland urban growth boundary. The result is that every land owner knows whether or not their property can be developed, and the favored understandably take advantage by charging whatever price the highly constrained market will bear. Reserve Bank of Australia research indicates that the price of raw land – Sydney urban fringe land for building a house that has not yet been fitted with infrastructure (sewers, water, streets, etc.) has now risen to a price of about $190,000 for a one-eighth acre lot. In the days before smart growth, the land would cost about $1,000. Needless to say, adding an unnecessary nearly $190,000 plus margins to the price of a house makes housing less affordable. But even where development is nominally allowed, government restrictions make building almost impossible. For years the state government has promised to “release” land for new housing on the western fringe. Yet despite announcement and re-announcement, there have been interminable delays. Destroying Housing Affordability: As a result, Sydney is now the second most expensive major housing market in the six nations in our Demographia International Housing Affordability Survey, trailing only Vancouver. Sydney’s Median Multiple (the median house price divided by the median household income) is now 8.3. It should be close to the historic norm of 3.0 or less. Indeed, if land prices had risen with inflation from before urban consolidation, Sydney’s Median Multiple would be less than 3.0. As a result, households entering the housing market can expect to pay nearly three times as much for their houses than was the case before. This will lead to an inevitably lower standard of living compared to what would have otherwise been. Forcing Density: Urban consolidation is destroying not only housing affordability, but also the character of Sydney itself. 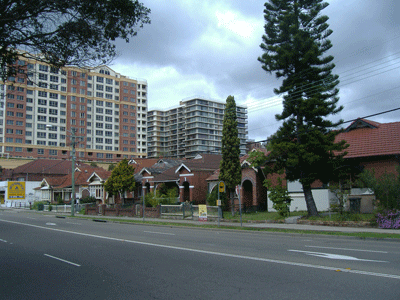 Sydney is an urban area of low density suburbs. It is also an urban area of high rise living. These two housing forms have combined with one of the world’s most attractive geographical settings to create an attractive and livable urban area. 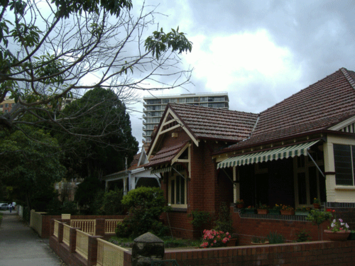 The planners, empowered by the state of New South Wales government, are changing all of that. From the suburbs of Western Sydney to the attractive and more affluent North Shore suburbs, high-rise residential buildings are being thrust upon detached housing neighborhoods. One of Sydney’s great strengths is that the urban area has many local government areas (municipalities), empowering local democracy. These local governments have done their best to resist the state government densification mandates, in response to opposition from their citizens. Raw Exercise of Power: One of Sydney’s greatest weaknesses is that the state government exercises undue control over the municipalities and is using its power to “shoe-horn” high density into places where it makes no sense. High density is fine in the Toney Eastern suburbs, but has no place where detached housing is the rule. Unfortunately, the planners seem to presume communities with detached housing have no character worth salvaging. Greater Traffic Congestion: And, of course, insufficient road expansion has been undertaken to accommodate the inevitable intensification of traffic congestion. The planners like to say that higher densities mean less traffic. In fact virtually all of the evidence, throughout the first world, indicates that more intense traffic congestion is associated with higher densities. Sydney is no exception. The average one-way work trip now takes 34 minutes, which equals that of America’s largest urban area, New York, which has more than five times the population and the land area as well as the longest travel time of any major urban area in the nation. Sydney’s planners delight in comparisons with Los Angeles, frequently suggesting that their regulations are necessary to ensure that Sydney does not “sprawl” as much as Los Angeles. Actually Sydney sprawls considerably more in relation to its population. The Los Angeles urban area is a full one-third more dense than the Sydney urban area. And despite the fact that nearly half of the planned Los Angeles freeway system was not built, Angelinos spend one hour less each week getting to work each than Sydneysiders. Even in Atlanta, with a pathetic freeway system little better than Sydney’s and one-third Sydney’s density, people spend an hour less commuting to and from work every two weeks and spend less total time traveling than in Sydney. The Economic Cost: There may also be an economic cost. Bernard Salt – perhaps Australia’s leading demographer – has predicted that Melbourne will overtake Sydney in population by 2028. Moreover, there has been substantial domestic migration from New South Wales to Queensland. At current growth rates this could lead the Brisbane-Gold Coast region being larger than Sydney by mid-century. Salt blames Sydney’s declining fortunes on its overly expensive housing.